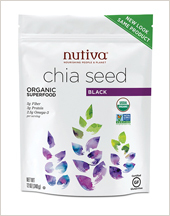 Nutiva is a company that sells many healthy products such as chia seeds, coconut flour, coconut manna and more. I was sent some of their products to try out. I really like their organic o'coconut treats. They taste like a coconut candy bar but without the chocolate. They have classic flavors and hemp with chia. I like both of them but the hemp with chia has extra nutrients which is great. One of these little treats has 60 calories and makes a great mini dessert. What I really love most from this company is their chia seeds. I am so obsessed with chia seeds. They are packed with protein, fiber and omega-3 fatty acids. I did not know how much I was missing chia seeds in my morning oatmeal after I ran out until I got them back. They add a great texture to oatmeal and help make it fluffier. Here is my favorite oatmeal mix. I mix it up ahead of time and then just scoop out a serving per day. To eat, I add 1/2 cup of this mixture to a mason jar and cover with water in the fridge overnight. This lets the oats and chia seeds soak up the water so they are soft and only have to cook a short period of time. In the morning, heat for 1 1/2 minutes and top with peanut butter. This is my Monday-Friday go-to breakfast and I cannot get enough. The addition of chia seeds is awesome plus it gives me a boost of nutrients. I also really like coconut and enjoyed trying the Nutiva coconut flour, buttery spread and coconut manna. I like the coconut manna spread on toast. The buttery spread is good on bread or in recipes. Coconut flour is very fun to cook with as a different type of flour. It is very, very high in fiber compared to other flours which is great. Nutiva makes tasty and nutritious products. I enjoyed trying them.